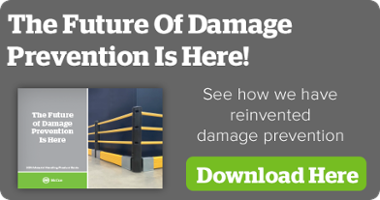 Put an end to costly warehouse collisions and start protecting your assets from all angles. Engineered specifically for the material handling industry, crash barriers from McCue will stop forklifts and heavy equipment from damaging walls, pallet racks and other infrastructure. Contact us today to request a quote. Warehouse equipment can do a lot of damage if left unchecked. Our crash barriers are designed to stand out and deflect hits and bumps. You don’t have to worry about everything tumbling down if an employee makes a wrong turn. The crash barriers are made of zinc-plated steel and polypropylene that is so durable it can push back against the hardest hits. Testing revealed that the crash barrier’s midpiece can stand up to a 45-degree angular impact from a 6,500 lb. vehicle traveling at 18.5 mph without being compromised. No matter where you put them, they are highly visible and easily seen. Use them to create traffic lanes and boundaries around equipment. They’ll organize the flow of traffic around the warehouse. Best of all, they’re simple to install, and you never have to worry about maintenance. Place them where you need them and forget about them. You’ll know your property is protected and your employees will be safe. At McCue, it doesn’t stop with crash barriers. We’ve entered the material handling industry in a big way. We offer an entire product line that safeguards every aspect of your business. We call it Total Warehouse Protection. We’ve been on the cutting edge of science and engineering for asset protection solutions since 1988. Browse our catalog of material handling solutions, and request a quote for our crash barriers today!